I can’t believe it’s been 9 whole days since I started this Challenge. Generally (when I’m not constrained with the 15-minutes rule), I would have completed all that we’ve done so far in ONE DAY. I’m not kidding. ONE DAY is all it takes to figure out the niche, buy a domain, install WordPress and run a quick setup, map out the funnel, launch the optin page, thank you page creation, and the first autoresponder. Any online business can be created with a step-by-step process. Each and every day – is ONE STEP in progress. 9 days ago, we had nothing. Then I worked for 2 hours and 15 minutes. Today, we have a complete opt-in funnel. In today’s 15-Minute Sprint, I was able to write down the first autoresponder email, and then tested the funnel and made sure the emails were getting stored in my autoresponder and that the Facebook pixel was working. This the first point of contact with your new subscriber – apart from the thank you page of course. But both the email and the thank you page are connected. Hot damn! I see so many people making the mistake of straight-up selling HARD. Why would people buy from you when they don’t know who you are and where you’re coming from. Even if you’re getting started with your first ever Email Business – YOU have a story to tell. The FIRST Autoresponder is about YOU! So introduce yourself, and try to hit some pain-points along the way. And make sure you either link out to the Thank You Page or the Affiliate Offer Landing Page that you’re promoting. Or if you’re promoting your own products – link out to that. If you’re following the model of giving out a FREE GIFT – then make sure the thank you page and/or the FIRST autoresponder has that free gift. 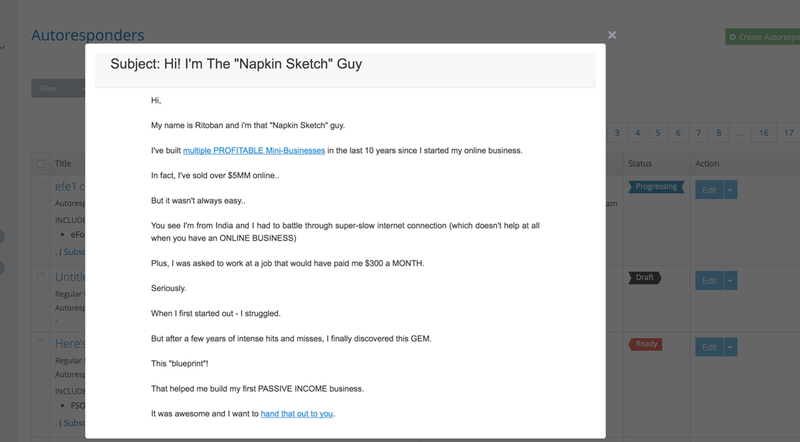 In my case, the free gift was the “napkin sketch” business model and we’ve given that away on the thank you page and also linked out to the thank you page from the first email. You want to learn Copywriting? Head over to Copywriting Academy by Anik Singal. After writing the autoresponder, our brand new Optin Funnel was finally READY. Before the testing process, I made small edits to the optin page inside Inbox Blueprint Launchpad and made it more congruent with the thank you page. And I also created special tracking links inside my affiliate panel, for tracking WHERE my sales come from. I simply pasted the affiliate links inside IMConversion and created multiple tracking links. Use Facebook Pixel Helper to check whether the Facebook pixel is being triggered – both on optin page and thank you page. BOOM! We are almost ready to start driving traffic. Tomorrow, I will write the next autoresponder email (gotta have at least 2) and also try to set up some FB retargeting ads.